A fire in a building on Gran Via street caused last Monday a large smoke column visible from everywhere in Madrid. Emergency services closed one of the most important avenues in Madrid to the traffic. Traffic was already been restored at 12:00. Even authorities have confirmed there is not any injured, at the moment we don’t know the causes of the fire. 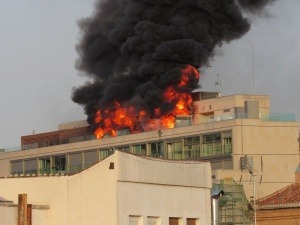 The flames and the smoke began at Gran Vía 48 around 8.15 in the morning. “Flames are confined to the roof and there is no likelihood of spreading” firefighters explained (six trucks arrived to the area in addition to ambulances and local and national police). Therefore, and despite the image offered by the fire, the building did not have to be evicted. The building, one of the newest in the avenue, opened in 2013 and was designed by the architect Rafael de la Hoz. The fire extinguishing forces forced to cut the avenue of the center at the beginning of the morning as well as the surroundings of the street for vehicles. Around 11.30 the circulation was restored. The building is the first new construction in the avenue. It takes almost a hundred luxury homes, ranging from 50 to 300 square meters, which came out in 2014 with prices ranging from 550,000 to 3.2 million euros (about 10,000 euros per square meter). Faced with the difficulties of selling the apartments, the price of the square meter currently moves around 6,500 euros. In addition, the company combines the sale with the tourist rental.